Jimmy Carter surely appreciates having his hemorrhoid bout from 34 years ago retold to a whole new generation. And when President Carter suffered from hemorrhoids did he actually say, “Me. Me. Me hurty.” like some whiny toddler, as implied by this commercial? Any advertisement for a product like this is going to gross some people out, but it really doesn’t help to have cheery whistling music in the background and a vaguely creepy pitchman. It seems, however, that products related to bowel movements just sort of attract those kind of people. 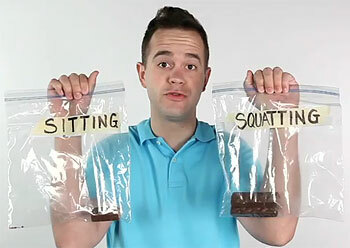 The money shot in the Squatty Potty infomercial comes when the intrepid pitchman holds up clear plastic bags with chocolate bars contrasting the amount of feces that plops out of a person when in the sitting or squatting positions. I will never look at a Milky Way bar the same way again! Why not just use a squat toilet? That’s out of hand! Besides being skeptical of the health claims, I am aghast and agog at the grossness of the commercial. I don’t know who has the worse job… the pitchman talking about “the brown stuff” or the guy who has to grunt and groan on the toilet. 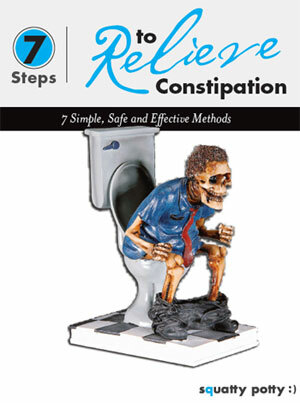 That’s a new low for infomercials. Thanks for the laugh! This commercial runs constantly on internet radio. I am sickened by it. Over six years later, and the Squatty Potty has gained respectability, garnering an impressive essay in The Guardian.